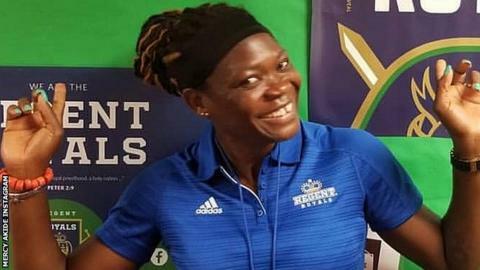 Former African Women's footballer of the year, Mercy Akide-Udoh, says preparation must be a priority for Nigeria's women's team to avoid an early exit at this year's Women's World Cup. The Super Falcons are scheduled to take part in the prestigious Cyprus Cup at the end of February and will then be at a training camp in Austria in the run-up to France 2019. But Akide-Udoh, who starred as Nigeria reached the quarter-finals of the 1999 World Cup, says more fixtures must be arranged for the Falcons. "To have a good tournament and avoid another embarrassing outing, the girls deserves to compete against the very best in the women's game to get themselves ready," Akide-Udoh told BBC Sport. "Other countries going to the World Cup are playing friendlies, but we are not which is not a good sign. "I have always said that Nigeria must start showing that we deserve to be at the World Cup and stop being contented with just participating since 1991," she added. Nine-time continental champions Nigeria are the only African team to have played in all of the Women's seven World Cup tournaments since 1991, but they have failed to translate their continental dominance on the world stage. Their best performance at the global event came when reaching the quarter-finals in 1999, losing narrowly to Brazil, yet they have exited the last four tournaments in the group stage. Akide-Udoh says the Super Falcons must improve tactically if they are to make any meaningful progress in France where they have been drawn in drawn in Group A alongside 2019 hosts France, Norway and South Korea. "We have a lot of work to do defensively and also in our ball possessions as well," she said. "Obviously, we are strong physically but we lack in the tactical aspects of the game and this has hindered the team's progress in bigger competitions. "Preparation is also key to enable the coach time to work extensively with the squad and correct some of the problems noticed at the last African championship. "Look at South Africa who are already in camp preparing, but the majority of our players are on holiday and inactive at club level. "Importantly, the women's game needs more structure in Nigeria and we cannot continue to treat it like we currently do." Akide-Udoh is a veteran of three World Cups, two Olympic Games and a winner of three African titles. Named the 2001 African player of the year, she is the first African to play in the US Women's Soccer League (Wusa), before it folded in 2003. In 2005, she was named by Fifa as one of its 15 Ambassadors for Women Football.